Middle Row: Tom Clarke, Roy Gardner, Unknown, Ted Fay, Roy McKay, Probably Ray Quinn, Unknown, Unknown. Brunswick’s (VFA) First Eighteen photographed at Brunswick ground in front of the concrete Brunswick grandstand, circa 1940. 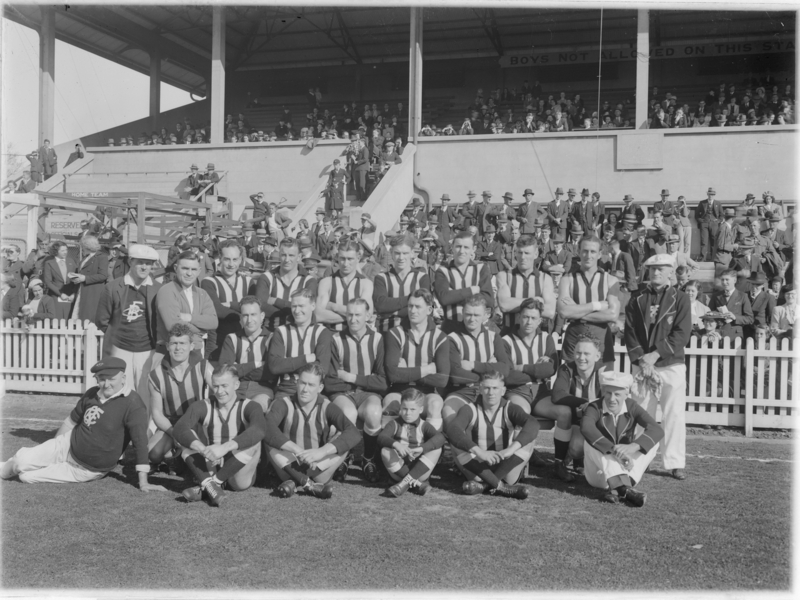 As in 122_085 - Brunswick Senior Team circa mid-late thirties, Roy McKay (captain-coach 1936-1940) is at the centre of the photo. Also seen in the middle row are former Essendon VFL players Tom Clarke (extreme left) and Ted Fay (fourth from left). Roy Gardner is second from left in middle row. It is noted that a number of men in the crowd are wearing Services uniforms. This would suggest the photo was taken in 1940. (The VFA was in recess 1942-1944).